There is a steadily increasing focus within organisations on managing change and maximising the opportunities change is supposed to generate through realised benefits and value creation. What are the responsibilities of the project manager when it comes to managing these changes? In part, the answer to this question depends on what aspect of the change you are dealing with. At one level, projects are initiated to instigate change. When the project is complete there is a new ‘product, service or result’ created, which means things are different—there is a change in the environment affecting the way at least some people behave and work. This may be a new building for people to make use of, a new or upgraded road to travel on, a new process to assist in the accomplishment of a business process or an improved software application, to name a few. But these things are only artefacts. The change that matters is in the behaviour of people and the way they choose to use the artefact or ignore it. If the organisation’s investment in the project is to realise its intended value, the output from the project needs to meet a need within the wider stakeholder community, and the people in that community need to be willing to make use of the product once it has been delivered. This aspect of change is primarily the responsibility of the organisation, not the project manager. The first aspect of this area of organisational responsibility is choosing the right project to do and making sure there is a project sponsor willing to champion the work. Defining the need that the project will be initiated to fulfil occurs before the project starts, and is largely the responsibility of the ‘performing organisation’ or the ‘customer’ and uses skills such as market research and business analysis to define what is required and to develop a viable business case. The project starts once the business case is accepted, funded and the project manager appointed. There may still be work to do to refine the business case or define requirements but the project’s objectives are pre-set. The only responsibility of project managers at this stage of the overall project lifecycle is to make sure they understand exactly what it is they are being asked to deliver and to highlight any omissions or issues to the sponsor. The second aspect of this area of organisational responsibility is traditional change management, which involves preparing the affected stakeholders for the new ‘thing’, hopefully creating a desire to use it once delivered and supporting the transition from the ‘old way’ of working to the ‘new way’ so the intended benefits can be realised. 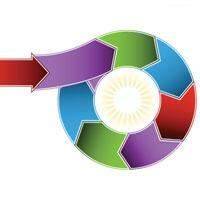 Organisational change management is a separate skill from project management. The change manager may be part of an overall program of work, or may work for the sponsor. It is very unusual to see either the project manager working for a change manager or a change manager working for a project manager: the two disciplines have very different focuses and require very different skill sets. But neither the project manager, nor the change manager, or the emerging role of ‘benefits manager’ can realistically have direct responsibility for the realisation of benefits; they do not have management authority over the people who will need to change behaviour to maximise the return from using the projects outputs. They each have a crucial (but different) role in proactively engaging with stakeholders to create the situation where the benefits can be realised, but the ultimate responsibility for realising benefits rests with the organisation’s operational or functional management. The emerging role of a benefits manager is largely advisory and often incorporated within PMOs or portfolio management, and in many respects is similar to the project manager and change manager. The benefits manager supports the organisation’s ability to realise value. Starts with the development of a benefits map for the project (typically as part of the business case). Provides advice during the implementation phase of the work to ensure project decisions do not unnecessarily compromise value by removing or preventing the realisation of benefits. Continues after the project has delivered its outputs to measure the actual realisation of benefits achieved by the organisation’s management. With or without the advice of a benefits manager, if the organisation is going to realise the maximum benefits from its investment in the project, the change manager and project manager need to be highly supportive of each other’s work and in combination put in place the capabilities needed to allow the organisation’s operational managers to realise value. Recognising most project stakeholders will be affected by the change and very often the project needs direct input from ‘end users’ and others to design its ‘outputs’. Project communications are communications to stakeholders and need to support the change management effort. Project communication will often pre-date change management communication and need to lay the foundations for the overall change initiative. It is a key responsibility of the project manager throughout the life of the project to be aware of the needs of the change manager (the change manager is a key stakeholder in the project) and adapt the work of the project (e.g. its communication strategy) to maximise the opportunity to realise benefits, where it is sensible to do so. It is very common for stakeholders to identify necessary or desirable changes in the product being produced during the course of the project. The project’s change management processes need to recognise the input from these stakeholders and manage them respectfully, with a view to maximising benefits. In summary, both the project manager and the change manager need to be aware of the needs and requirements of the other and work collaboratively to achieve the best overall outcome for the organisation, supported by the benefits manager (if one is in place) and coordinated by the sponsor. Organisational change, and change management benefit from the active support of the project manager, but are largely outside of the project managers direct responsibilities. Project change control is all together different. While the project manager typically does not have the authority to approve most changes, managing the overall project change control process is the direct responsibility of the project manager. Identifying that a change is required, requested or has already occurred (or is occurring). Scoping the change and understanding its effect on project objectives. Preparing recommendations regarding the change. Identifying the appropriate person with authority to approve the change; this may be the project manager for internal changes, for all other changes it is usually either the sponsor, a change control board, the customer or the designated customer’s representative (e.g. a superintending engineer). Cooperating with and supporting the change authority in its decision making. Managing the consequences of the change by implementing approved changes and ensuring rejected changes are not implemented. The connection between overall organisational change management and project change control is that every change that is managed through the project’s change control processes affects some aspect of the project’s outputs and should be considered from the perspective the ultimate use of the projects deliverables, its stakeholder’s needs and the overall realisation of benefits through the organisation’s change management processes. 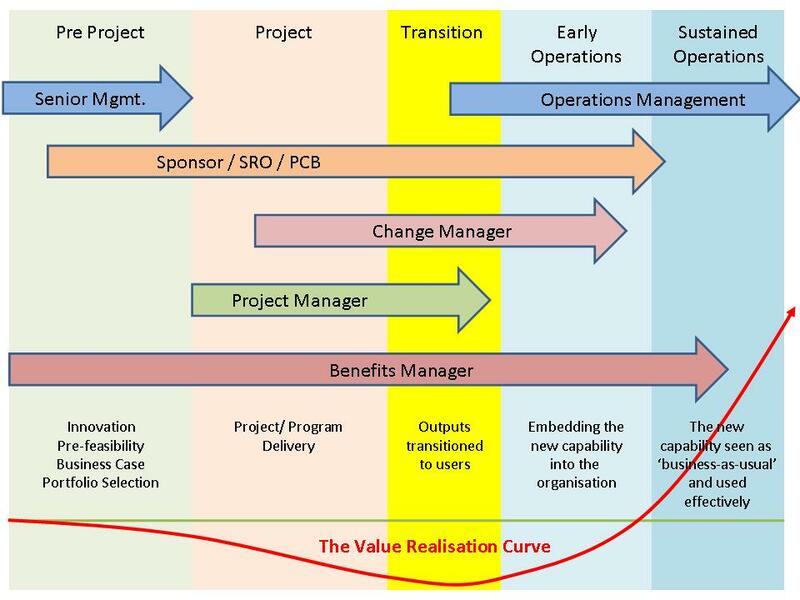 Managing the overall project lifecycle from idea creation and project selection through to benefits realisation and value creation is increasingly being referred to as ‘the management of projects’ and is an organisational capability. The difficult bit in the middle focused on creating the project deliverables is ‘project management’. To successfully implement a change, both the overall ‘management of projects’ and the work of ‘project management’ need to be synchronised if the maximum value is to be realised by the organisation. Doing the wrong project right or the right project badly helps no one. Realising value from an organisation’s investment in its projects requires the right projects to be done right, and then making sure the outputs are actually used to create value: this is a team effort that spans all aspects of project and organisational management.